Elo´s 1229L is equipped with outstanding additional features for a high quality monitor at an economical price, including a rear facing customer display, biometric fingerprint recognition device, and a Magnetic Stripe Reader. The 1229L incorporates space-saving technology using a small footprint to ensure maximum efficiency. Its 12 LCD screen has higher brightness and better contrast than most 12 LCD monitors on the market. Every Touch Monitor is protected by Antireflective surface treatment. Available with AccuTouch Five-Wire Resistive Technology (activated with fingernails, gloves, credit cards, or any stylus) or, for the ultimate in optics, IntelliTouch Surface-Wave Technology, CarrollTouch Infrared Technology, or Surface Capacitive. Acoustic Pulse Recognition Touch Technology is also available. This is a revolutionary new technology that works by listening for the touch on the glass. 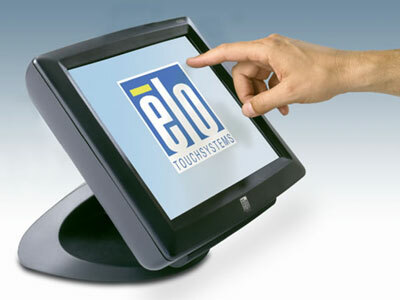 This innovative technology combines the best qualities of all other Elo touch technologies (IntelliTouch, AccuTouch and CarrollTouch). Integrated USB hub with two available USB connections. Also allows a single USB cable to carry the touch signal, MSR and fingerprint data, and output to the customer display. The serial version has cables/external connectors to carry the touch and MSR data.